Milly is snuggled on my lap right now purring and happily curled into a little warm ball. Tony is still sleeping and the apartment is still and quiet on this crisp morning. I’ve got my coffee (which I’ve made too strong) and my Grandma and Mom are here for Thanksgiving festivities. 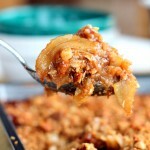 My plan is to make them a big bowl of green chile stew and this apple crisp recipe for them tonight. Spicy and sweet before we stuff ourselves silly tomorrow. That’s the way I roll. 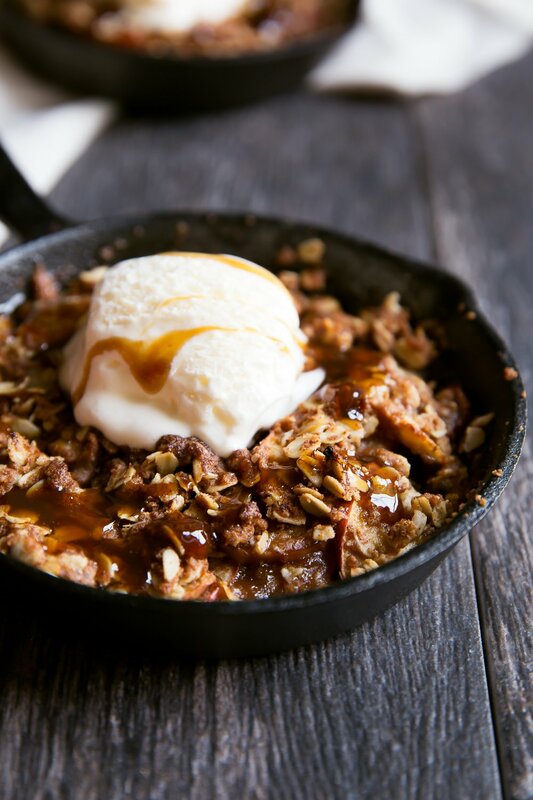 I’m a big fan of apple crisp and the ease of making it. (Well, besides chopping and slices the apples, of course.) I always find it to be the coziest of the comfort desserts; warm, full of cinnamon spice and simply the best with a big scoop of vanilla ice cream. Maple syrup and coconut sugar instead of processed sugar. Whole wheat flour instead of regular flour. And if you’re up for it, coconut milk caramel for a little glaze on top. (!!!) That means this recipe is dairy free too! The most important part of this recipe though is the apples! DUH. The apples need to be sweet and crunchy — which is why I used my favorite SweeTango® apples. I mean, if you haven’t had the chance to try them — you absolutely must! You’re usually able to find them more in the fall, so be on the lookout at your grocery store. 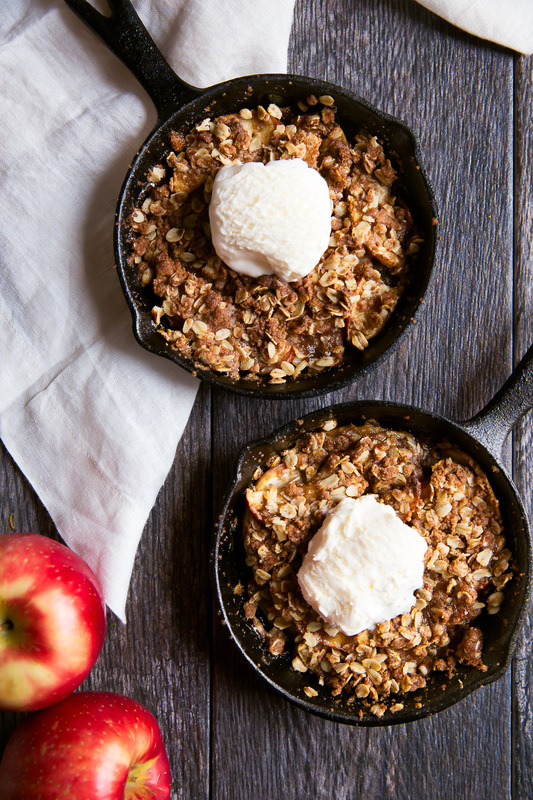 And please, please, please – make this apple crisp! HAVE A WONDERFUL THANKSGIVING! xoxo. 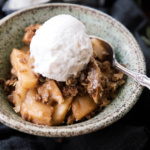 A delicious dairy free apple crisp made with SweeTango apples, maple syrup, coconut sugar, vanilla and a FABULOUS coconut milk caramel sauce. This recipe serves two people so it's perfect for date night. Preheat oven to 350 degrees F. Grease two small skillet pans, medium ramekins OR a small quart size dish or loaf pan with nonstick cooking spray. 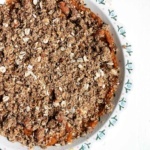 To make topping: Combine the flour, oats and brown sugar in a large bowl until well-combined. Add in melted coconut oil and stir until the mixture is crumbly and resembles wet sand. 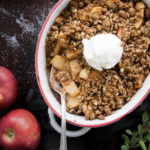 Make the filling by placing the sliced apples, maple syrup, cinnamon and vanilla in a large bowl and toss to combine. Take 1 tablespoon of the topping mixture and toss with the apple mixture. 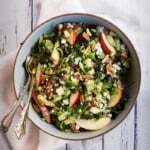 Place the apple mixture in prepared pans (evenly distribute) and sprinkle with the topping. Bake the crisp(s) on a baking sheet (just in case the filling bubbles over!) for 40-45 minutes or until topping is golden brown and filling is slightly bubbly. Remove from oven and cool 10 minutes on a wire rack. To make the coconut milk caramel: Whisk coconut milk, maple syrup, coconut sugar, vanilla, sea salt and coconut oil together in a small saucepan over medium-high heat. Bring to a low boil and simmer for about 20-30 minutes until the mixture boils down and thickens. Make sure you stir every few minutes. Once mixture has thickened up, remove from heat and allow to cool for 10 minutes. This should thicken the mixture up even more. 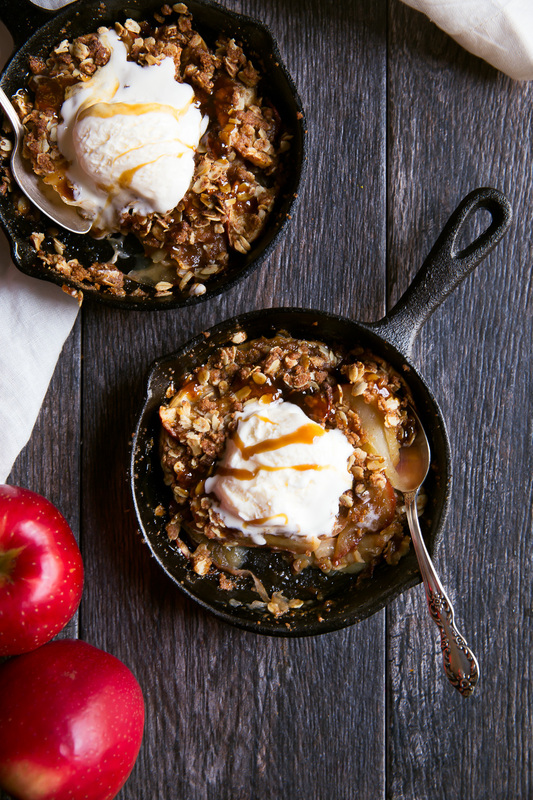 Serve apple crisp with ice cream and large drizzle of coconut milk caramel. This post is sponsored by SweeTango apples. All recipes, opinions and texts are my own. Thanks for continuing to support Ambitious Kitchen and the brands that help make this site possible! 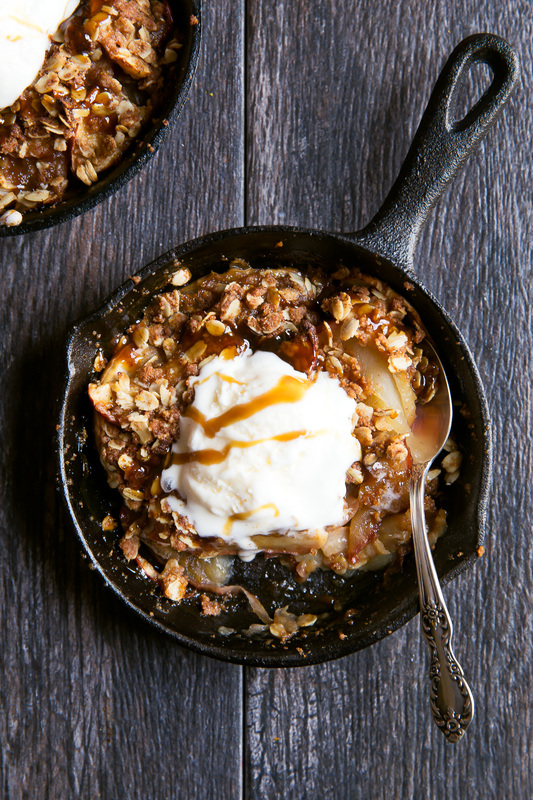 20 Responses to "Vanilla Coconut Milk Caramel Apple Crisp For Two"
This sounds so good!! I really love that coconut milk in there! You NEED one of these: http://www.amazon.com/Johnny-Peeler-VICTORIO-VKP1010-Suction/dp/B001DLTD1C/ref=sr_1_1?s=home-garden&ie=UTF8&qid=1448375668&sr=1-1&keywords=apple+peeler+core+slicer It will save you a ton of time with the apples. Don’t get a cheap one but one from a reputable company (mine is from The Pampered Chef and is going strong after about 20 years). 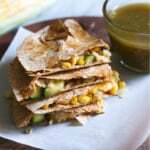 Off to read the recipe; looks delish!! Gotta try baking those SweeTango apples. I’ve had them as snacks, but never cooked with them. I just made some apple crisp on the grill but yours look so much prettier. I love that you used coconut products in it. Healthy and tasty. The photos are just stellar. These pictures are beautiful and the crisp sounds totally amazing! 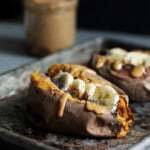 I love this clean version of a classic fall dessert!! I think I will make this for our next date night!! I love that you made these in a cast iron skillet- it makes them that must more rustic and special. This looks beyond delicious! This dessert looks like perfection!! Im sure the coconut milk makes it super creamy and dreamy! I have died and gone to heaven! I make fruit crisps all of the time. They are pure comfort food, especially now that the weather has turned cooler. I really love your coconut milk caramel sauce…sounds amazing! This is quite a healthy delicious recipe, Monique! I’m a big fan of apples, too. I need to try this. WOW, this looks so scrumptious! Except, although the recipe yes “apple crisp for two”, I’m afraid I couldn’t share the other half with my better half, haha. All for me! could I sub honey for the maple syrup in the caramel sauce? I’m out! What substitute can be used for the coconut milk ? Any substitute for maple syrup? I have always disliked it – yes, I know I’m the only person on earth who hates maple syrup, but I truly do! Brown rice syrup would work well!